While it might seem insane, it is quite possible to lift some pretty extreme weights if done correctly. As it may seem, technique can make all the difference in the world. For many many years we have all wondered how things like Stonehenge and the great pyramids were built, and I recently came across a video that could be simple enough to explain it all. This video from an EXN.ca broadcast covering a man from Flint, Michigan. His name Wally Wallington and he sure does seem to know a good bit about moving blocks even though he’s nowhere near the scientist you might expect. He is simply a retired construction worker of sorts. Stonehenge is a prehistoric monument that was built about five thousand years ago. Not much is known about it or how it came to be and many question how it was constructed even now. Because of how old it is, many do not believe that mankind would have been capable of placing the stones in the ways they were placed. Several years back he set out to build his own replica of Stonehenge and in doing so also planned on moving the blocks himself. Wallington has even on film shown just how simple it is to move massive pieces of stone some even as heavy as a ton without much issue at all. His technique through using pebbles and other things of the sort to really set it all in motion. It seems he believes quite strongly that those from ancient times used some kind of similar method to put their structures forth as well. In the video, Wallington even notes that he moved a barn and could move just about any block if he needed to. All he has to do is place a stone under it and find a means of balance so that he can spin it and from there everything else falls into place. He notes having moved blocks weighing around one ton about three hundred feet per hour. This being a serious feat for a mere man. Sure, some of this might sound a bit crazy, but as you will see in the video below, it is quite real and very possible. What do you think about all of this? While the video is a bit old it is still truly mind-blowing and I am at a loss for words. Perhaps this truly was how not only Stonehenge but also perhaps the pyramids themselves were constructed. Who knew the answers could have been lurking in the backyard of a retiree for so long? I guess this kind of thing answers a lot of questions many of us have, doesn’t it? Sadly, I was unable to find anything online about whether or not he succeeded in building his own personal Stonehenge or if he got bored and gave up. We can only hope that he continued with his project and made something truly spectacular. 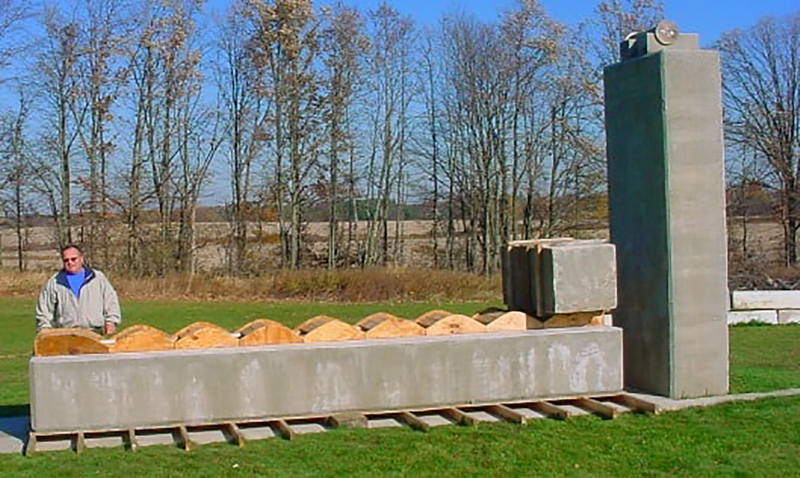 Wouldn’t you like to have a mini Stonehenge in your backyard?